As his readers know, Mark Twain is wonderful company. He is wise, witty and unrestrained in his criticism of American life, manners and morals. It seems that little of what went on in the 19th and 20th centuries escaped his keen eye, sharp wit and swift pen. His observations — many of which found their way into short stories and tall tales — became grist for the humor mill he pumped on the lecture circuit in his later years. Now, [more than] a century later, these observations are being repeated, and his readers are being treated to another Mark Twain. Offering a glimpse of the “oral” Mark Twain is actor Ken Richters, who spent three years researching the life and works of America’s greatest humorist, Samuel Langhorne Clemens, before launching “Mark Twain On Tour.” Friday night’s one night stand at the University of California Berkeley was a sell out, and comes near the end of Richters’ own successful tour. 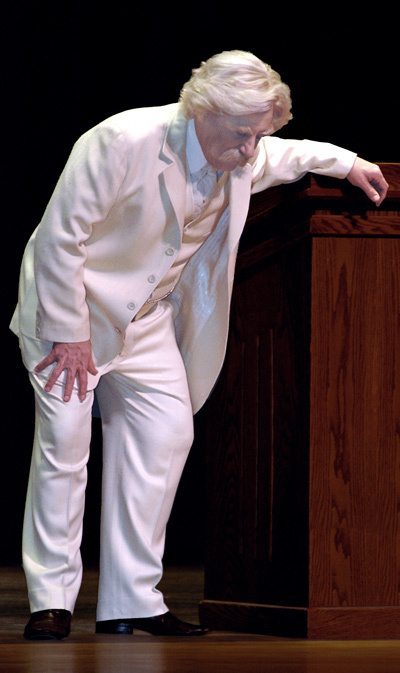 Richters, who has been featured on several television series, shuffles on stage wearing a white linen suit and carrying a cup of coffee and today’s newspaper. 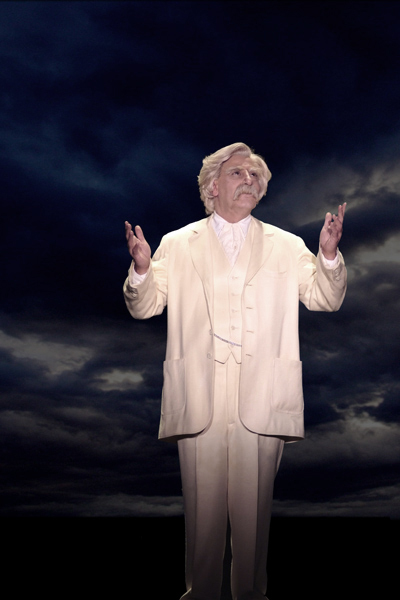 A white wig, glass of whiskey, cigar and three hours of make-up application complete the characterization of Twain. But it’s in the words that we find the real man even when the words aren’t really his, but only predicated on what Mark Twain probably would have said if he were here now. 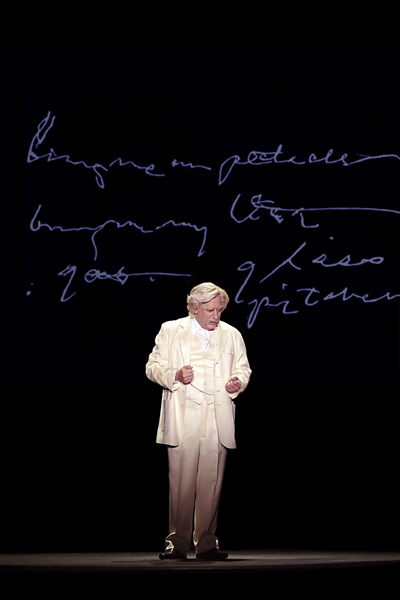 Part of the joy — once you get over the discomfort - of Richters’ performance — is that he intersperses Twain’s observations and criticisms of the past with his own of the present — usually at the expense of the audience. Most of the joy, however, comes from Twain’s own words: his reminiscing about growing up in Missouri, living on the Mississippi and working and making friends in the California Gold Rush days. As Twain, Richters makes immediate contact with his audience, looking directly into their faces, looking for someone to talk to. 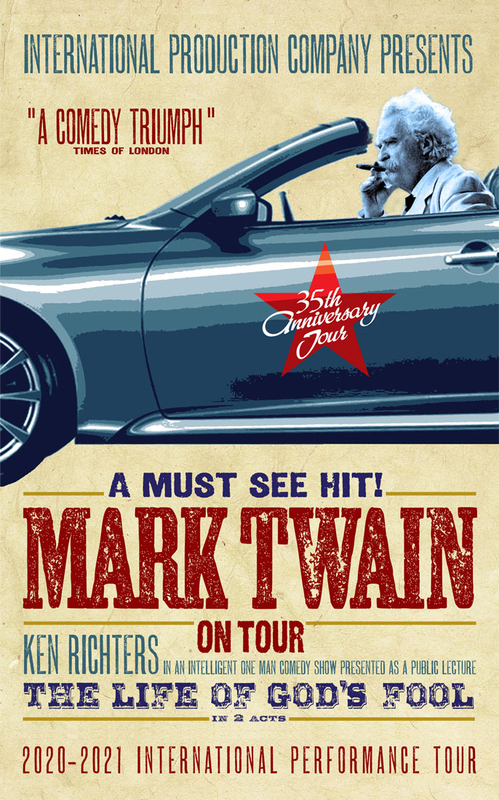 As he spins yarns, pokes fun at politicians and generally points out the failings of the human condition, Mark Twain comes to life. 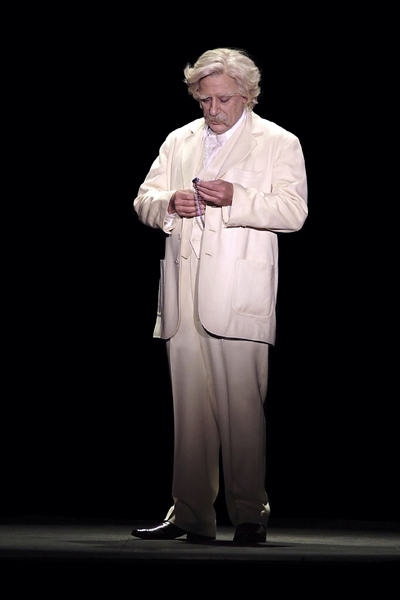 By the end of the performance, we know Mark Twain more intimately and understand more fully the man who loved to point out the shortcomings of others while caring deeply for them. In “The War Prayer” he pleaded with the audience to keep a sense of humor about themselves, or we’ll have war. Few American literary personalities have captured and held our interest to the extent that Mark Twain has. He is an indisputable American with southern roots and northern temperament, the adventure of the West under his belt and the sensibilities of the East in his heart, a man of peculiar cynicism with a surefire sense of irony, penetrating wit and certainly enduring charm. Richters, a young, dark-haired man, undergoes a remarkable transformation for the show. He appears as the crusty gray-haired author in his advanced years. The white linen suit, cigar and whiskey, of course, are standard props for the characterization. Richters shuffles across the stage, leans on a podium and relaxes in a chair, all the while speaking, spinning yarns, dropping Mark Twain’s astute observations upon the audience like pebbles in a pond and waiting for ripples of laughter to spread across the hall. The certain testament to Mark Twain’s appeal and skill is the morose and cynical subjects on which his humor is focused. Imagine sparking sidesplitting laughter with topics like these: He encourages an anarchist friend to blow his brains out with a revolver. He assists a client of his insurance company to cripple himself and collect on a policy; he informs a woman that she has suddenly been widowed by delivering to her a carpet with the remains of her husband woven into it, a result of an industrial accident; he even gets laughs by dropping his cigar and spilling his booze over the stage. And he demonstrates a calculated dislike for teachers, politicians and journalists. As in the case with most astute observers of the human situation, Mark Twain’s brilliance in illustrating human faults and foibles in attributable to the fact that he possessed many of them himself. The man who made a career of vilifying humanity for its lack of concern and foolishness was himself inconsiderate of others and careless in his own relationships. It is to Richters’ credit that a subtle sense of that comes through in his performance. His Mark Twain is a man who acknowledges and accepts his own shortcomings but characteristically chooses to poke fun at those of others. Another aspect of Twain’s later years was his tendency to wax serious from time to time. This came through nicely as Richters ended his performance with “The War Prayer”, Twain’s rambling but impassioned plea for humans to resist the temptations of war. Another significant aspect of this show is that the real Mark Twain appeared more than a century ago at Mechanics Hall, probably much as Richters did last night. Again Richters took note of that fact, working in several references to his earlier visit to the hall. Richters’ performance, which unfortunately was a one-night stand, made us wish he will return again. 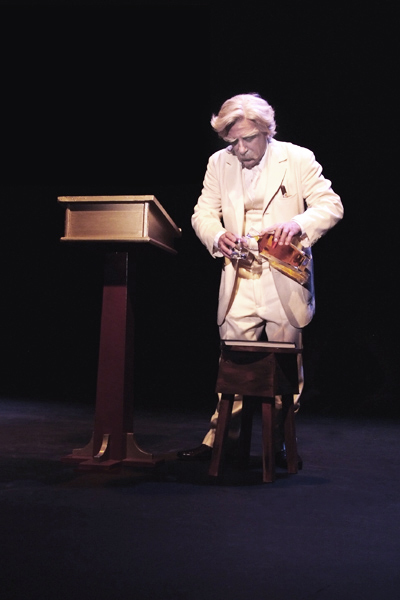 Mark Twain stood on an almost bare stage Thursday night and shared his wisdom with an appreciative audience. 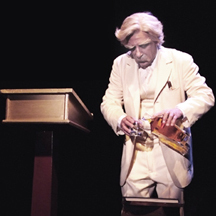 Episodic television actor Ken Richters wore a white suit, a wig and held a gold pocket watch to become the legendary author for an excited audience at the Houston International Festival. 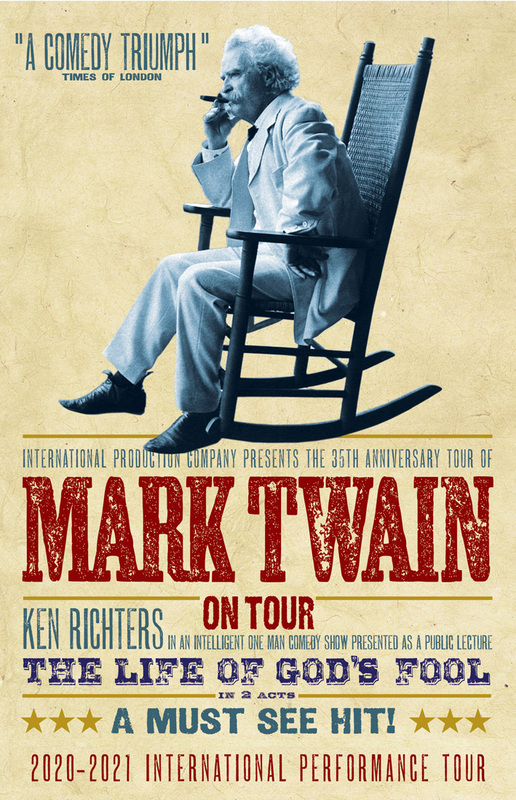 Richters was set up well for “Mark Twain On Tour.” On stage he had a chair, cigar resting on a nearby table, a podium and an intelligent audience who knew when to laugh and when to pause for thought during his performance. In a strong but aging voice, Twain via Richters told the crowd how to live life to the fullest. Among many things, Twain talked about God, cigars, the proper use of commas, his home in Missouri and old age. Richters started the program well and used crowd-pleasing references to the Houston area. He spoke of coming to Texas, Houston and its leaders. The region’s climate and Texas City. He made the audience laugh at themselves. 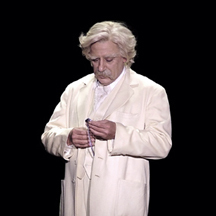 The actor began more than three decades of touring as Mark Twain in January. Richters’ research and feeling for Twain became apparent from his performance. Richters presented a funny, intelligent and thought provoking night of entertainment. He excelled as he shuffled across the stage and made the audience laugh at every turn. It is not easy to put on a one-man show and Richters did it exceedingly well. Friday night the great American humorist and writer Mark Twain walked the stage of the Music Recital Hall at Southern Oregon State University, and for two hours held an audience spellbound with his views on life and death, God and humanity, youth and age, and worlds real and imagined. 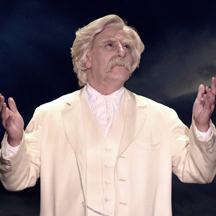 From his first entry, through his final exit, Richters is totally within the character of Twain as many people envision the author: mane of white hair, mustache, white suit and a walk that slightly drags the right foot. But Richters’ performance goes deeper than the external features. It is more than assuming the Missouri accent and somewhat nasal voice. It goes beyond the creative use of a cigar as a prop. 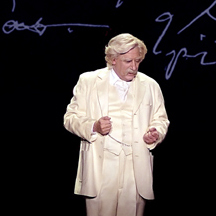 Even though Twain has been physically dead for [over 100] years, he lived Friday night in Richters’ performance. In character, Richters introduces himself as Samuel Clemens, who wrote under the name Mark Twain. Richters began researching Twain in 1977. Now he has a reserve of about five hours worth of material from which he draws two hours, so each program is different than another. Richters edits Twain’s writings into local context. Friday night he turned the pointed flame of Twain’s humor on southern Oregon, to roast SOSU and its faculty, the cities of Talent and Ashland, and, at some length, the Mail Tribune. As Clemens-Twain, Richters said, “It’s a well known fact that God put a number of idiots in the world. Just look at the faculty.” And, later in the program, “The average age of teachers here at the college is dead. Do we have any teachers here? Now that I know you’re here, I’ll speak slower.” The audience responded with applause. He compared Twain’s birthplace, Florida, Mo., a town of 99 people, with Talent. In the best tradition of Clemens’ monologues, Richters begins a subject, takes a few turns through side roads of me mores, then gets back to the punchline of the original statement. Convoluted anecdotes are sprinkled with one liners, jokes in which a laugh line is topped with another laugh line. Richters closed the first hour of his presentation by, in Twain’s voice announcing an intermission, saying that when he returned, he would talk about the Governor and “Possibly the Mail Tribune. Possibly not.” Following the intermission, he kept both promises. Twain spoke of sitting in his room at the Ashland Hills Inn, which he had already described as not a hotel, but “a hospital for incurable furniture.” While he was in the room, he heard a knock on the door. “Nothing in my wildest dreams could compare to the evil that was on the other side of that door. It was the editor of the Mail Tribune newspaper. They mail it to you so you don’t realize how old the news is.” The audience loved it. Throughout the show, Richters’ made us feel that we were sharing an evening with the great humorist himself. His timing was excellent. His inflections, posture, walk and mannerisms created a genuine character. There was no false note. He spoke in many of Twain’s voices, from oratory to whisper. When the audience wasn’t laughing or applauding, it was listening in attentive silence. Richters himself is much younger than the Mark Twain he presents. He reportedly spends three hours in applying makeup, wig and costume for the role. Near the conclusion of the program, Twain recalls returning, as an old man, to McDougal’s cave, a location from ‘Tom Sawyer,’ “ to see if he can re-experience his youthful search for buried treasure, when he and other boys used to play at being pirates.